BLOOMINGTON, Ill.— Illinois Wesleyan University’s School of Nursing Professional Staff Laboratory Associate Becky Altic, RN, BSN, CHSE, has received designation as a Certified Healthcare Simulation Educator (CHSE) through the Society for Simulation in Healthcare. Altic is the simulation expert for the School of Nursing (SON). She works collaboratively with SON faculty to develop, implement and evaluate simulations as an integral learning experience in all core clinical nursing courses. Simulation in nursing education is a method to guide students in clinical scenarios and allow them to experience dynamic clinical events in a safe environment. 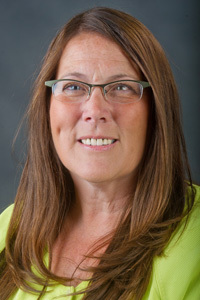 Research findings confirm that well-designed, high-fidelity simulation is effective in preparing students for complex direct patient experiences by promoting clinical judgment in a safe learning environment, according to SON Director and Professor Vickie Folse, who is also the Caroline F. Rupert Endowed Chair of Nursing. Altic works with faculty to incorporate simulations in all core clinical nursing courses. Illinois Wesleyan’s SON recently opened a new simulation center featuring a redesigned and enhanced simulation environment. Altic has been involved in simulation education for more than a decade. She was the first simulation coordinator at what was then BroMenn Regional Medical Center. Additional experience included projects for Illinois State University and the McLean County Area EMS System. Altic said she is excited to be part of a network of educators who are committed to improving and defining best practices and standards in simulation education. Altic earned a Bachelor of Science in Nursing from Mennonite College of Nursing in 1993. She initially practiced in critical care and open heart surgery at OSF St. Joseph Medical Center. She also worked as a Mother/Baby Unit staff nurse and charge nurse at BroMenn before becoming the simulation coordinator in the Clinical Education department.